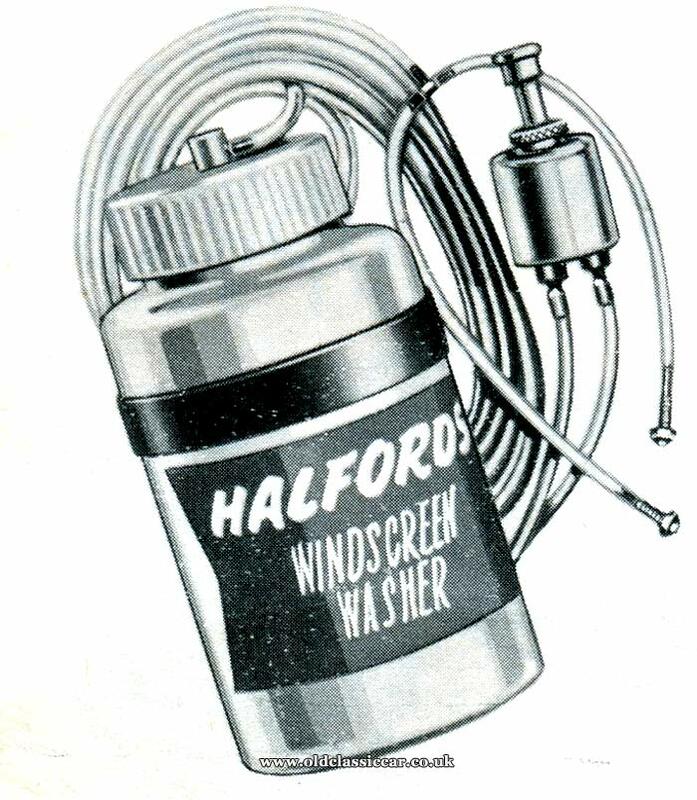 Windscreen washer kits available for cars in the 1950s. Homepage. This page: Options for a cleaner windscreen, offered to motorists in the 1950s and 1960s. Windscreen washer options in the 1950s. Many are the pre-war cars that didn't come with any factory-fit method of spraying water onto the windscreen, prior to operating the wipers. As a result, it wasn't difficult to scratch one's glass screen. The 1950s would see more and more new cars sold equipped with screenwashers as standard. Low-cost cars often had to make do with a simple "press the plunger repeatedly" manual arrangement, which was better than nothing, while more luxurious vehicles tended to be equipped with perhaps a Trico, or Lucas, installation, the best of which incorporated an electric pump. The law in the UK states that every road vehicle now needs to have a windscreen washer arrangement, if wipers are fitted, unless it is a pre-1986 agricultural vehicle, or one that cannot exceed 20 mph. My understanding is that if a classic or vintage car has an opening windscreen, or one small enough to see over, then washers aren't technically a requirement. However, many owners decide to retrofit screen washers to their old car, or upgrade their press-the-plunger type to an electrically pumped alternative. This page describes a number of the more popular alternatives that were available to motorists in the 1950s, so that any upgrade made today is in-keeping with what might have been fitted, "back in the day", and is therefore period-correct. Only one Tudor screenwasher is listed in this particular catalogue. 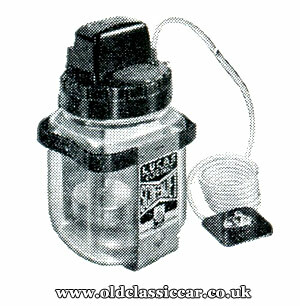 Although the advertisement doesn't specify exactly how the screenwash was propelled onto the screen, I think this is an example of the basic pump-the-plunger type, actuated either by hand or foot. 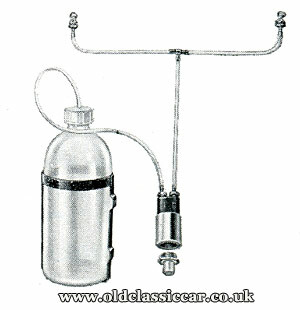 This type of system was typically fitted to fairly cheap new cars in the period, but could be bought as a kit in order to upgrade an older vehicle with what is after all, a very useful and safety-related accessory. Trico is a name synonymous with windscreen wipers and washer installations, even to this day. In the 1950s and 1960s, they offered a number of aftermarket installations, four of which are shown in the image below (not to scale). On the left is the Trico "Ato-Matic". This type relied on being connected to a spare tyre to propel the screen wash liquid, so was therefore suited to a car that had the spare wheel situated in the front, such as the VW Beetle. The downsides of this arrangement include relying on the spare tyre to actually be present, and reliably holding sufficient air to operate the washer whenever called upon. Carrying a footpump was definitely to be recommended. If you'd had a flat tyre during a journey, and had to actually use the spare wheel and tyre, then you were left with no screenwashers for the remainder of the journey, and indeed the vehicle's continued use, until the puncture had been repaired, or tyre replaced. Not always ideal, but better than nothing. Alongside the Ato-Matic is the engine-powered, ie vacuum-operated, type. Both "large jar" and "small jar" versions were offered, as were specific kits suited to Fords, 1951-1956 Vauxhalls, and Rolls-Royce, the latter costing nearly half as much again as the others. Third in the above line-up is the Trico "Duo-Matic", which gave a six second blast of screenwash mixture at the touch of a button. Prices ranged from 32/6 to 39/6 depending on the car that it was to be fitted to. Last of the Tricos shown above is the "Spraywipe Duo-Matic", which was designed to co-ordinate the use of the washers and electric wipers by activating a foot- or hand-operated plunger. A single centre jet (two outlets), or two separate "easyclean" jets, could be specified. Tex is another name from the past, often associated with motoring gadgets and accessories (for example they produced a wide variety of wing-mounted mirrors at the time). 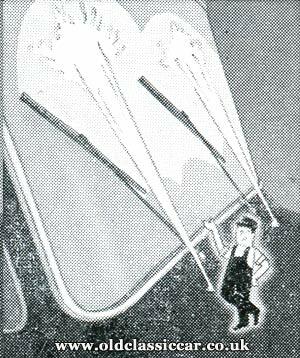 The "Rainmaster" was their contribution to easy screen cleaning in the post-war years, as shown here. 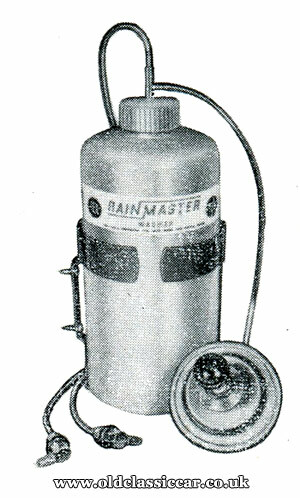 While more expensive kits included a chunky glass jar for holding one's mixture, the Rainmaster had to make do with a cheaper, albeit lighter, 24oz or 40oz plastic reservoir. Most expensive of all the options described on this page is the Lucas Screenjet. Whereas many other kits had to rely on vacuum, or hand-pumping, the Screenjet incorporated an electric pump, offering the best possible spray. The downside was the cost, whereas other kits were typically in the 30-50 shillings price range, the Screenjet cost 72/6. Handily both 6v and 12v types were offered, so even Joe Bloggs in his 6v Ford Pop could use the Lucas installation. Like the aforementioned makers, Desmo was a name inextricably linked to all manner of car-related accessories and gadgets, over several decades. Here is their, very simple, kit, called the Kigass. Two jets, a length of tube, a polythene bottle and bracket, and the operating plunger, were all that was needed. By the 1960s, all new cars had screenwashers as standard. Saying that, people were still building their own specials and kit-cars, or fixing up cars that were no longer in their first flush of youth. Due to this lingering requirement, it was still possible to buy a basic aftermarket screenwash kit. The following example was advertised by Halfords in 1966. A basic manual plunger type, it did the job. Return to the motoring gadgets, tools & accessories pages at oldclassiccar.